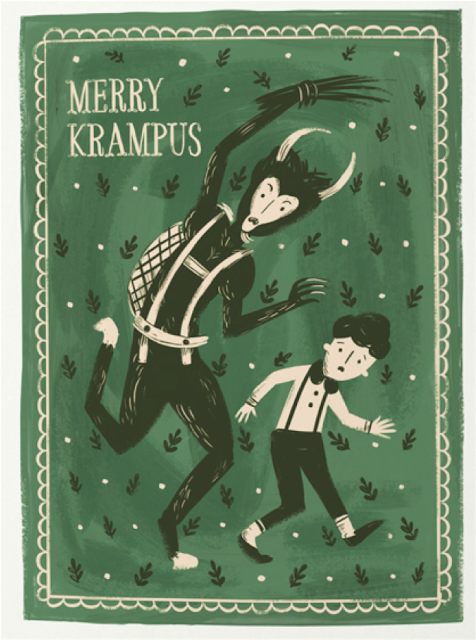 a spot of whimsy: Festive Fridays | Merry Krampus. Festive Fridays | Merry Krampus. See ya later Fall Fridays, Festive Fridays is back! First of all, after yesterday's post, I'm sure you are all dying to hear my review of NBC's live Sound of Music, so here it is: it was a little bit weird. The singing was beautiful, Carrie tried her darndest and Stephen Moyer had a much better singing voice than expected, but the acting was pretty stilted, and I just wanted it to be Julie Andrews and Christopher Plummer. It did seem to get better as it went on. If you watched, were you able to separate the two versions better than I could? Did you enjoy? Now on to more festive things: it's the first weekend of December! Christmas activities, commence! C and I, along with our respective siblings (it's brought us together, hehe), have recently developed a slight obsession with Krampusnacht, Germany and Austria's myth/folklore/tradition of a dark, beast-like figure who seeks out naughty children the night before St. Nikolas Tag (St. Nicholas Day), which happens to be today! Here's hoping your shoes are filled with candy this morning, and that you weren't dragged to h-e-double-hockey sticks by Krampus last night! Have a wonderful weekend and Merry Krampus!